Hiralal Mazumdar Memorial College for Women, Dakshineswar well known institute around Kolkata has emerged as a centre of excellent learning experience. It is a hub of emancipation for the girls who flock to the campus from adjoining suburban and rural belts of Hooghly, Howrah and North 24 Parganas. The idea of imparting education to the women folk of the society was conceived nearly six decades ago. The road ahead was bumpy, scattered with challenges; yet our zeal to strive for a noble cause continued unbeaten. It is forbidden to stop unless we scale the lofty height of elevating the college. The institution adheres to the ideas of discipline, dedication and determination has remained the basic principles that guide us to the path of perfection.It works as a vehicle to ease the journey of our Mission – to help students spread the wings of their desires and dreams. Our aim to educate, empower and emancipate in compliance to the needs of the society. We are keen on grooming students in application oriented; need based learning to improve their cognizance beyond the norms of classroom teaching. I welcome you to the website of Hiralal Mazumdar Memorial College for Women a prominent and transformative college of North 24 Parganas. 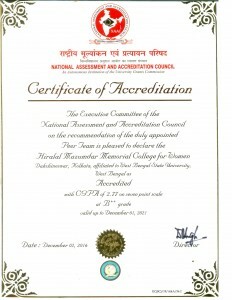 Hiralal Mazumdar Memorial College for Women is a girls’ college, founded by Late Amritalal Mazumdar in the memory of his son Shri Hiralal Mazumdar who expired in his young age. Later a Trust was formed to run the administration of the college. The authority of the college is grateful to the members of the Trust for their contributions and cooperation. In 2000 there had been a shift in its governing system under the jubilant leadership of the then Principal, Dr. Santudas Chakraborty; from Trust administration the college was adapted under 1993 Act and could find its recognition under the affiliating system of the University of Calcutta. Now, Hiralal Mazumdar Memorial College for Women, Dakshineswar is a constituent college of the West Bengal State University. The college started its journey on 10th August, 1959 with the primary objective of providing the opportunity of Higher Education to the girls of the locality irrespective of cast, creed or religion. It started functioning with handful of students on the rolls in a very few UG courses, mostly humanities. Now it offers as many as 26 general and 18 honours courses, along with newly introduced B.com general course and certificate course in Computer Literacy. Today the college is proud to be able to offer both Urdu (Honours) and general courses to women belonging to minority section inhabiting Kamarhati constituency and its adjacent area.. Initially the college was affiliated to the University of Calcutta, but since 2008 the college had to shift its affiliation to newly formed West Bengal State University, Barasat. With this change in affiliation, the college administration is witnessing a qualitative change in its role in academic decision making. Unlike many other Universities of India, West Bengal State University is continuously trying to incorporate its units, i.e. the colleges in its decision making process. Though it is not an autonomous college, still with this effort the college now feels empowered to frame its own courses of study, by giving its own valuable inputs and suggestions to University policy makers and to adopt innovative methods of teaching and learning. NAAC’s reaccreditation in 2016 with a B++ grade has elevated the college with potentiality in the minds of local population, as well as surrounding academic institutions. The college aims at training young women to be the leaders in all walks of life, who we hope will play vital role in bringing about the desired change in the betterment of the people of our country. The college fosters an atmosphere of intellectual vigour and moral rectitude in which the youth of our country may find their fulfilment and achieve greatness as eminent women of service. The college knows that there is no room for complacence and we need to acknowledge that we have to prepare young minds to face challenges of an emerging knowledge society which is changing at an unprecedented pace. I am convinced that the joint endeavour of all members of the Governing Body, IQAC, all the stakeholders, guardians and parents would shoulder the responsibility to ascertain a brighter future for the college..
College is bent upon grooming the students to competent, committed, creative and passionate women that would set them apart from the rest. We seek to motivate and encourage our students to spread their wings of ambition, find emancipation of life, and yet remain firmly saddled to traditional values. The college dreams of scaling dizzy heights of academic excellence at least at the state level. Embraced by the nature’s beauty, bestowed with the tranquillity, Hiralal Mazumdar Memorial College for Women is the epitome of knowledge, virtue and righteousness. It is rightly said that knowledge is the key to success and prosperity. Six essential qualities that are the key to success are: Sincerity, Personal Integrity, Humility, Courtesy, Wisdom and Charity. The college is taking such small steps with all sincerity, dedication, determination and devotion to herald an academic atmosphere to facilitate pedagogic learning yoked to practical application of said learning in different vistas of life. The strength of our college is its staff, both teaching and non-teaching, whose commitment and dedication have made a difference in the lives of the students leading them to become socially conscious and responsible citizens of country. It had only 8000 books in its library in 2015; now with the tremendous efforts of the librarian and library staff the college the number escalated to 20000(approx) books. Besides, NLIST and NPTEL programmes facilitate the opportunity of e-learning to its students. It is an opportune moment to acknowledge the contribution of Ramakrishna Mission, Professor Ashok Mukhopadhyay, former Netaji Subhas Chair Professor of Calcutta University and P.C. Chandra group for their generous contribution of books and financial aid to the library. The Book Bank facility in the library is an added advantage for students belonging to low income groups and first generation learners. The system of periodic teacher- evaluation done by the students, regular parents-teacher meetings, regular academic audit by Academic sub-committee and IQAC and the internal monitoring mechanisms for the teachers and administration of the college are few regulating mechanisms through which the academic ambience is sustained. The college is blessed to have a Governing Body with intellectual members from academic world and the able guidance of the president of Governing Body. The college is also proud to have an organised Students’ Union, committed non-teaching unit and enlightened faculty. With this energy and zeal the college is now gearing up for CBCS mode of teaching learning and simultaneously proceed for the third cycle of NAAC reaccreditation in 2021. The college strives to produce confident young women who will be able to lead a life of conviction and purpose. The college provides a safe, nurturing and inclusive environment where young women are encouraged to explore, experiment and investigate. 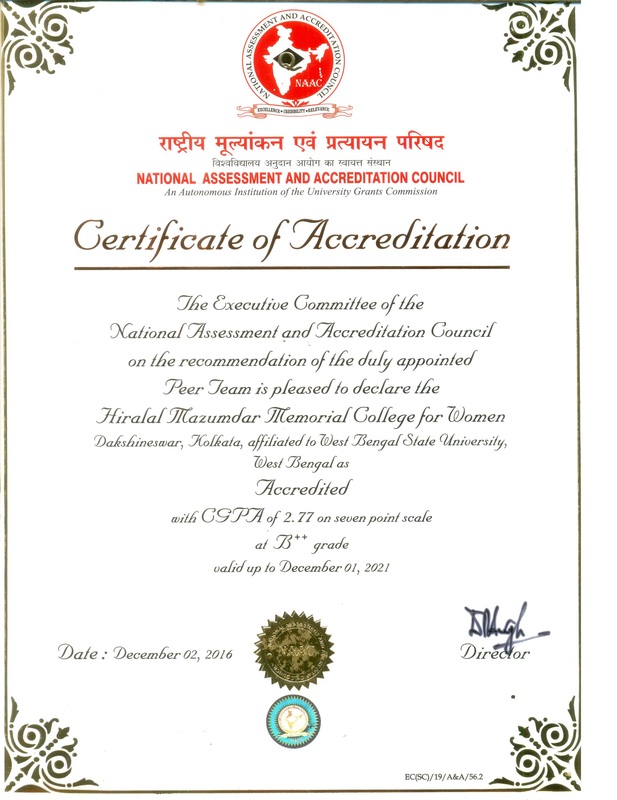 Hiralal Mazumdar Memorial College for Women prides itself in continuously striving to provide a real, relevant and holistic education for young women. The college is embracing a twenty-first century learning ideals fostering a creative and innovative approach to learning in tune with the need of our country, with a focus on preparing students for their contribution to a boarder global society and importantly towards their own self-fulfilment. Our college is one which truly inspires excellence and makes a world of difference. This unit organises workshop & seminer with various companies who offered job oriented courses. Departmental seminars and U.G.C. sponsored National and State Level seminars are held in the college. The college has a rich library with a good number of rare books in the stock and with reading room facility. Our College has highly equipped Physics, Chemistry, Botany, Computer Science and other subjects’ laboratories.